From the west via Nigerpass/Passo Nigra (1668m) one starts just below the pass at 1704m. The longest and hardest climb and probably (have not done it from that side yet) most rewarding starts to the east down at Birchabruck/Ponte Nova (872m) or quite possibly all the way down from Kardaun/Cardano (286m) and climb via the nice Eggental/Val d’Ega and Karersee to the pass. Other comments There are a few flat kilometres just east of the pass. At the pass there are restaurants. The road up from Bolzano through Val d’Ega/Eggental was very nice with its gorge, but now the old road is closed and one has to go mostly through tunnels (but possibly the old road might open to cyclists again). (See the Virtual Alps web page.) 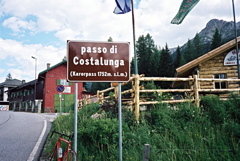 (Pas de Costalongia and Pas de Mont are Ladin variant names for the pass. Passo Carezza is an Italian variant name.) See also: Reiterjoch/Passo di Pampeago (1996m); Passo di Lavazè/Lavazè Joch/Passo de Lavazzé (1807m) and Passo di Oclini/Joch Grimm/Jochgrimm (1990m).